PACK EXPO 2018 is right around the corner! Have you added Dorner to your show planner yet? If not, CLICK HERE and make plans to see us in Booth N-4936! We’re currently putting the finishing touches on our displays and getting them ready to head to Chicago, IL. One of the displays we are sending to the show is our Package Handling Loop. This loop includes two SmartFlex® conveyors outfitted with FlexMove®Technology, a 2200 Series nose-over squeeze, a 3200 Series bottomless squeezing conveyor; and two 3200 Series conveyors with Activated Roller Belt™ (ARB™) Technology, which is a patent-protected technology of Intralox. The SmartFlex Twist uses two SmartFlex Conveyors with FlexMove technology to turn a product up to 90° per conveyor pair. The 2200 Series nose-over squeeze is a pacing conveyor featuring a FlexMove common mount. The 2200 Series conveyors are run at a slower speed than the mainline SmartFlex which creates a gap between products. The final portion of the loop features a 3200 Series bottomless squeeze conveyor. 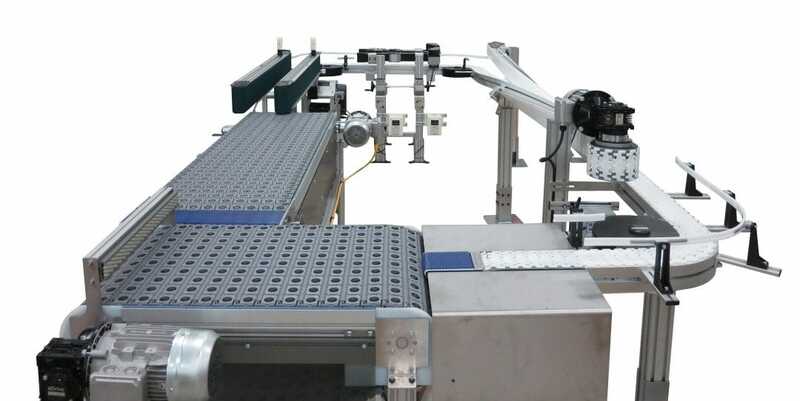 The bottomless conveyor design allows for access to the underside of packages for processes such as taping, labeling and/or inspection without the need to turn the product. Check back next week for our fourth preview featuring our Sanitary Loop!